While most of the preseason hype in college basketball circled around Duke, Villanova, Michigan State, and Arizona, few expected the best player in college basketball to be a freshman point guard on an unranked preseason team. Trae Young was a five-star recruit, despite being relatively undersized. He matriculated from his hometown of Norman, Oklahoma to nearby Oklahoma and through half a season, has been downright dominant. Young leads the nation in more statistical categories than seemingly possible. He’s currently atop the national leaderboards in (deep breath) points per game, assists per game, usage rate, assist rate, points produced, PER, and box plus/minus. To date, the Sooners have 10 wins and only one loss, dropping a game at the PK80 event to a strong Arkansas team. Prepping a scouting report to slow down Trae Young is a tall task that now faces every Big XII coaching staff. His offensive game is so well-rounded and complemented by his teammates that finding his flaws is far more difficult than simply trying to mitigate his biggest strengths. Using tape from the Sooners recent win over Wichita State, we’ll see exactly how Young enforces his will no matter how the defense counters. Lon Kruger is a smart coach who has a ton of experience at a variety of levels of basketball. Oklahoma is the fifth high-profile college basketball program he’s helmed in the last 30 years. In that time he also had a stint as the head coach of the Atlanta Hawks and a year as an assistant for the New York Knicks. Needless to say, he’s been around the block once or twice. In Oklahoma’s first eleven games, it’s clear that Kruger firmly understands what he has in Trae Young and is building his team in a way that puts Young in a position to succeed. The easiest way to do that is by involving Young in pick-and-roll offense. He has the shooting, driving, and passing abilities (which we’ll look at later) to be a terror with a simple screen action. It’s almost like giving a dual-threat quarterback read-option or run-pass option plays with which to attack holes in the defense. Young is skilled enough to create holes in the defense and smart enough to exploit those holes. Young perfectly changes speeds and waits for each of the defenders he’s reading here to commit one way or the other. He draws the Wichita State rim protector forward, leaving his big man open for an easy bunny (though we’ll forgive Young’s teammate for the travelling violation here). In that clip, notice how the Wichita State big man hedges on Young hard and stays with him, forcing Young to be patient and make the hook pass. That’s what Young forces opponents to do, thanks to his outside shooting. If you hedge briefly or not far enough, he will make you pay by knocking down a three. Young’s shooting ability opens up more lanes to attack when defenders are pulled to the perimeter. Just when you think he’s going to nail the stepback jumper, Young hits a stutter move and zips into the lane for a soft floater. By the way, notice the time and score in that package of plays. Each of these pick and rolls happened in the first eight minutes of the game against a team ranked 26th in the nation in defensive efficiency. Young doesn’t need to adjust throughout the game. His entire arsenal is ready to fire from tip-off. Trae Young is one of the best shooters in college basketball, without question. The freshman point guard is making 41 percent of his threes, which is impressive but not otherworldly at this point in the season, until you account for the circumstances of his attempts. He’s shooting 9.7 outside shots every game and making more than four of those. Not to mention, he’s making those shots off the dribble, unassisted, and from EVERYWHERE. Only 38.6 percent of Young’s made threes come via an assist (per Hoop-Math.com). Compare that number to other prolific NCAA shooters like Jalen Brunson (65 percent), Grayson Allen (87 percent), and Kyle Guy (97 percent!!) and Young’s ability to create his own shot jumps off the page. On top of that, Young shoots the ball from well beyond the NCAA 3-point line. Check out the spots where he made his threes from in the first half versus Wichita State (including a GIF of a crazy stepback move to close it out). Once Trae Young crosses halfcourt, he’s a threat to shoot. Vegas casinos should start taking bets on which body part of the Jayhawk at center court at Allen Fieldhouse Young is going to hit a shot while standing on. Despite needing to create his own space at the rim, in mid-range, and outside, Young shoots as good or better than some of the best scorers in basketball. At the rim, despite his size and lack of flashy athleticism, Young is still able to find ways to finish. Leading the nation in assists per game is an impressive feat. Young’s work as a passer is even more impressive, by adjusting to a per possession basis and still leading the country in assist rate. A mind-blowing 57 percent of his teammate’s baskets come via an assist from Young when he’s on the floor. He does this with a combination of extraordinary court vision and knowledge of his teammates. The pale, gangly shooter making that mid-range jumper is freshman Brady Manek. He’s a knockdown shooter from outside the arc, and no one understands that better than Trae Young. Even if Manek is across the court or seemingly uninvolved in the play, Young knows where Manek is and knows exactly how to get him the ball with a chance to shoot. Watch here as Young draws the defense to the lane then nails Manek right in the hands in a spot for him to fire off an open three. Young’s vision is always firing on all cylinders. On the last play of the first half in this game, Oklahoma allows Young to isolate with a chance for the last shot. He drives to the rim, but at the last second rips off a miracle pass to an open shooter in the corner. It’s a play and a pass that almost no college freshman makes on a regular basis. Young has paced the Sooners in every facet of the game, with Oklahoma playing the nation’s 5th fastest tempo. Almost like the Steve Nash era Suns, every Oklahoma player knows exactly who to look for when grabbing a defensive rebound. Young’s ability to push the pace and take advantage of transition defenses makes for a high-octane attack. The average Oklahoma possession is only 13.7 seconds, the fourth shortest of any team in Division I. Off a blocked shot here, Young corrals the ball and immediately pushes the action. Any team playing Oklahoma needs to be fully aware of where Young is at every moment. In the blink of an eye, he can flip the court and find a scoring opportunity for himself of a teammate. Ok, so this one is a bit less important than the others. 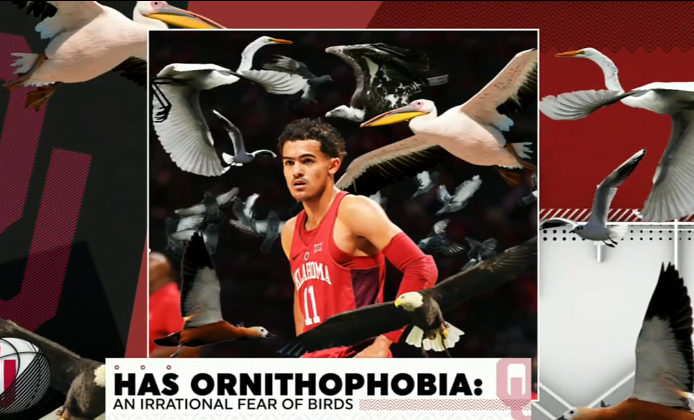 But as a fellow bird hater, I’d like to let Trae Young know I’m with him and I appreciate his work in spreading awareness of the cause. Thanks to ESPN for one of the weirdest graphics in recent memory.